Appearance: Beautiful red amber that looks more brown when held to the light. Pours a very nice white two finger head that leaves behind decent lacing. Smell: Delicious blend of spicy hops with a little cinnamon and clove with subtle malty sweetness. Initial Taste: Spicy herbs start this winter brew off followed by sweet malts and a crisp hoppy bitterness. Well balanced and easy to drink. 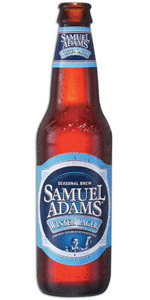 Thoughts: Just in time for the Patriots season Samuel Adams Winter Lager is finally available on the supermarket shelves. Sam Adams has a reputation for great seasonal selections and this beer is among their best. With notes of cinnamon, cloves, oranges and hints of chocolate, this beer is among the best of the winter season brews. The flavors are bright and crisp and easy to pick out. The spiciness is warming and makes this the perfect beer for those cold winter nights. I had this beer on tap last week with a really nice burger and while not generally a fan of lagers, this one from Sam Adams hit the spot! I’d say your review is spot on especially with the flavor. I had a few, so yeah its an easy drinker!